Earlier in the year I gave a rather sniffy review of Frank Darabont’s The Mist (2007), laying into what I saw as its very two-dimensional characterization and repeated insistence on B-movie cliché. Well, I take it all back, because compared to this remake of the 1951 Robert Wise sci-fi classic, Darabont’s film looks like a spectacular cinematic coup: The Day the Earth Stood Still is a shambles, not knowing whether it wants to ape the original film or diverge onto some sort of modern-day warning of impending environmental catastrophe, and ultimately succeeding with neither. For those who are unaware of the original film, it can be summarized thus: alien craft land in Manhattan, man-like alien come out, man shot, biiig angry robot come out, man begin to learn about humans’ war-like ways, man have message for humans: stop killing each other or be destroyed by aliens, man leave. Rightly regarded as a classic of its time for its clear anti-war message, a worldview looked upon with suspicion in a time of anti-Communist paranoia, what makes it endure is not necessarily the quality of the production but the pointedness of its social commentary. Thus, a remake which tries to do the same but with a modern-day relevance seems plausibly a good idea. Unfortunately, the film makes a complete hash of this. It appears that Keanu, sorry, Klaatu, the smaller of the two invaders, this time has been sent here to warn us that the damage the human race is doing to the environment is the evil which has deemed us worthy of galactic destruction. He meets scientist Dr. Helen Benson, who helps him to escape government incarceration, and in doing so she becomes an unwitting representative for humanity, and must convince him that we can undo all this bad stuff we’re doing to our planet. Man. Surely a noble cause? Unfortunately, a quick squint at some of the unsubtle product placement throughout the film renders this all a bit silly – do we save the world by driving Honda cars, using LG palmtops and eating at McDonald’s then? Or indeed by throwing huge amounts of C02 into the atmosphere by making films which exist solely to keep Keanu Reeves in acting roles? Well, no, i don’t think that’s what Al Gore was trying to tell us. It gradually becomes clear that what the film is trying to manoeuvre us into thinking is that it is Dr. Benson’s love for her adoptive son, coupled with her Nobel-winning colleague Professor Barnhardt’s work on altruistic biology, are enough to prove that mankind is trying to do something about it all, and so is ultimately worth saving. So we are to believe that while the aliens have done phenomenally complex research into studying our behavioural patterns, levels of industrial output and its consequent damage to our ecosystem, what they hadn’t managed to spot was Jennifer Connelly being nice to Will Smith’s son, and John Cleese scribbling on a blackboard. 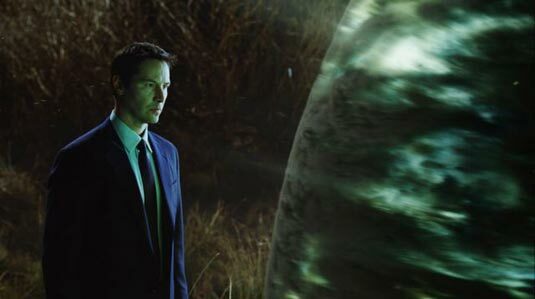 There is a spectacular lack of tension, or indeed scale, throughout the proceedings, but what really deflates the piece is Keanu Reeves, who at first seems very apt to play an alien unfamiliar to a human body – after all, he spent the majority of the three Matrix movies just wandering around with a confused look on his face. Unfortunately, the role here demands a little more than that, but his entire lack of ability to convey any sense of empathy or emotion just makes you wonder why Klaatu decides to spare us all in the end anyway. And there is one unintentionally hilarious moment where he starts speaking in Mandarin which lost all seriousness for me because it made me uncontollably think of a scene from Wayne’s World (1992). Two points which did make me think: number one, the notable absence of the President of the USA from proceedings – he and his VP we are told have been ushered away to the safety of a bunker, a dry commentary in what will be one of the last films of the George W. Bush era. Secondly, all of the obvious Biblical connotations to the Klaatu/GORT axis, as well as talk of apocalypses, floods, arks etc.. etc.. sit very uneasily with me in a film supposedly about global scientific co-operation. Creationism really needs to stay away from environmentalism.